If you’ve been trying to wrangle up some options for a unique vacation that will force your family to unplug, you’re in luck. We’ve found the coolest off grid vacations for kids in the U.S. that are guaranteed to inspire adventure and engagement. Scroll down to find out where your next unplugged family vaycation should be. Experience the rugged beauty of Wyoming with an outdoor adventure guided by the professionals at OARS. This getaway cuts the whole family off of everything electronic for a week and includes hiking, kayaking, fishing, rafting. It's also a rare opportunity to experience an itinerary that takes you to remote areas on the water in the backcountry where you will encounter plenty of wildlife and little to no evidence of human life. Get ready to witness Old Faithful in all of its glory, take in Yellowstone Falls, spend an evening beneath the Tetons on Jackson Lake, explore the waters of Bearpaw and Leigh Lakes, fish for trout in creeks and pristine waterfalls, paddle your way to Spalding Bay and enjoy a scenic rafting trip along the iconic Snake River. This OARS tour may only last five or six days, but the memories you make and take home with you will last a lifetime. Your adventure starts the moment you board the commercially chartered aircraft. It carries you to Campo Cortez in the San Ignacio Lagoon, and there’s nothing quite like catching a bird’s eye view of the Baja landscape as you make your way to this whale-watching mecca. Once you land, you’ll be set up at the solar eco-powered base camp in a cabin with a stunning view of the lagoon. Your kids get the opportunity to visit the whales that play in the area twice a day on guided tours. The whales have been migrating there for thousands of generations, and your crew may even get a chance for an up-close encounter with mama whales and their baby calves as they are known to approach boats for friendly interactions. Additional activities for your active tribe include tide pool excursions, kayaking in the mangrove estuaries, beach-combing and watching the diverse wildlife in the area. Price: Start at $2,325 but vary according to excursion and time of year. 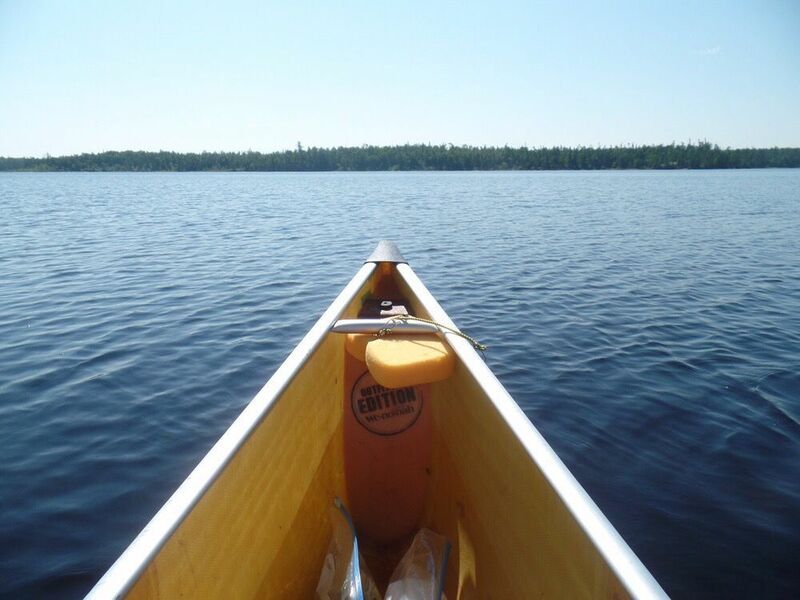 Head to the Northwoods of Ely Minnesota where canoe country will sweep your family away for a stretch of time filled with wholesome, nature-based entertainment. If you prefer to lead your own adventure but appreciate a little help preparing and packing for your excursions, then head to Boundary Waters Outfitters. There you will find package options that set you up with all of the gear you need to explore the Boundary Waters. Imagine guiding your crew along small rivers and across glacial lakes where you will spot bald eagles, river otters, and moose. Eventually, you can fish your way to a spot where you might spend the evening around the campfire and the nights staring up at the star-lit sky. No guide included, just you and your clan braving the untamed wilderness (no phones allowed). Packages do include trip routing and detailed maps along with a continental breakfast the morning of your trip and free showers when your return. The Griswolds would be proud! Note: guided adventures are available for those looking for a more relaxed approach to their vacation. Saddle up and take to the plains and prairies of Kansas with the kids. Located in the Flint Hills, the Flying W Ranch sits on 7,000 acres of property where guests get a chance to experience the cowboy lifestyle. There’s tons of horseback riding to be done, but this family adventure goes beyond the average with cattle drives and prairie burns guests can actually participate in. Between long trail rides, fishing trips, hikes and wildflower walks, your days will be filled with traditional adventure and the nights are no less impressive. Go on a moonlight horse and wagon ride or head out for hours of uninterrupted star gazing. Accommodations appear rustic on the outside, but they have all of the necessary comforts so you can get good sleep at the end of long days filled with activity. A trip to this ranch guarantees epic stories to be told long into the future and a likelihood the whole tribe will want to come back. One way to grab your kids’ attention is to take them into the untamed wilderness of West Texas. Far Flung Outdoor Center offers families the opportunity to float the Rio Grande on overnight excursions that can last anywhere from two days and one night to four days and three nights. They have a variety of trips to fit different interests and abilities, but one thing all of the options have in common is the lack of cell service, traffic, and people. While on the water you’ll have the opportunity to explore the canyons of the Rio Grande in Big Bend National Park. There’s plenty of time for swimming, hiking and mom and dad can even relax with a glass of wine. You may have to do some paddling, but you won’t have to do any cooking or cleaning. Far Flung staff takes care of the less vacation-y stuff and let you enjoy your time away from society. Who would've imagined you’d find the ideal unplugged farm experience in New York? Retreat from city life to this safe haven located in the Catskills about two-and-a-half hours Northwest of the Five Boroughs. Accommodations at the farmstead are truly off-grid with luxurious platform tents to keep your sheltered. If the mention of tents gave you pause, not to worry. These roomy locations have canopied ceilings, canvas walls, wood floors and enough room for a cabinet bed, a set of bunks, and a large secondary room. And yes, there's a bathroom. Feel free to kick back or get busy pitching in. Your kids are sure to enjoy gathering eggs, visiting with the farm animals or wandering the property. Meals are served onsite, and you can end your day with quiet evening playing board games. For an opportunity to turn your young tech-heads into naturalists, head to this sustainable island paradise. Little St. Simons is an all-inclusive resort like no other located on Georgia’s Golden Isles. With seven miles of beach and 11,000 acres of the undeveloped wilderness, there are endless natural wonders to explore during your vacation. The property offers families a twice daily complimentary naturalist program that boasts guided kayak tours, garden tours, fish printing workshops and a chance to meet some sea turtles. While there is plenty of time and opportunity to commune with nature, the all-inclusive aspect of your stay on the island shouldn’t be overlooked. You get to enjoy unlimited soft drinks, beer and wine and three full meals along with hors d'oeuvres and snacks prepared by seasoned chefs. And you have full use of recreational equipment like bicycles, kayaks, and skiffs, as well as the fishing tackle—so the fun never runs out. Ages: The Island does not allow children under the age of 7 from October-April to ensure that all guests are old enough to enjoy the seasonal nature activities. A truly off-the-grid adventure awaits your family just beneath the towering wilderness of Little Spencer Mountain at Spencer Pond Camps in Maine’s Moosehead Lake Region. Stay in cabins that are over 100 years old with zero electricity and only wood stoves to cozy up by. This rare opportunity gives your family the chance to truly experience what life used to be like before the internet, phones, computers and central heating came along. Each cabin has docks for the young swimmers to jump off and your family is provided with bikes, kayaks, and canoes to use throughout your stay. Imagine afternoons filled with frog catching, picking berries and just relaxing and listing to the local, natural inhabitants. If you want to take your Maine experience to the next level book an unforgettable float plane ride or a white water rafting trip. There’s even the option to take a cruise on the Steamship Katahdin on Moosehead Lake. Your family will love this very On Golden Pond experience. Mountain Sky Ranch is a dream opportunity for families looking to turn off electronics and tune into nature. Set on 17,000 acres of wilderness, the property is located in Paradise Valley and runs all the way to Gallatin National Forest. There are a variety of lodging options for families to choose from including restored cabins built in the '20s, small lodges with stone fireplaces, and options with picturesque views set to the soundtrack of a nearby babbling creek. One of the best parts of the ranch experience is that it offers “choose your own adventure” options. Fill your family’s days with hiking, riding horses, fly fishing, and yoga. There are even kid and teen programs that will help your young'uns learn how to re-engage with their surroundings when separated from their digital devices. Additional opportunities include evenings spent around the campfire, hayrides, and getting your dance on—western style. Head to Florida for an off-grid cabin retreat on the stunning Wacissa river. Surrounded by towering white oaks, pines and ancient cypress trees you will feel secluded from the rush of everyday happenings. VRBO offers up a beautiful lodge that was built out of river logs pulled from the Wacissa river over 100 years ago for your family's rustic stay. The owners claim visitors will have an off-grid experience and they mean it. None of the utilities are powered by the utility company. Solar panels and a backup diesel generator keep the power running. There is central heat and a wood burning fireplace to stay warm by, but zero Wi-Fi is available! Just outside the cabin’s door, a beautiful catwalk will take you and the kids down to the spring-fed river where a dock awaits. There is airboat access from the river to the cabin and airboat tours are offered for your family to enjoy during their stay. Your kids will love the eco tours which include a rundown on the river’s history, an opportunity to sharpen your photography skills, fishing, and sightseeing. They even provide frog gigging tours! What is your family’s favorite unplugged adventure? Share it with us in the comments below.